Wipro Technologies is planning to open a development center in Atlanta and plans to hire 200 people to work at this center. It also plans to increase this number to 500 over the next three years. This is interesting because of the fact most companies shift the jobs to Asia to lower costs and Wipro is doing the opposite and this is what they have to say. Most Indian software companies already hire people out here, but those are for specific projects. I am not sure if any company has a dedicated development center here in the US. We will have to wait and see how this model works out for Wipro. I had written about a post that I came across in Google Blog gift to Indian users. Today, they revealed that. It is basically a gadget for iGoogle that will let you type and search in 14 Indian languages using an on-screen keyboard. 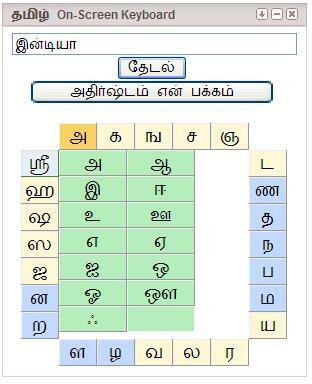 The languages supported include Hindi, Tamil, Telugu in addition to few more languages. The Hindi transliteration was also part of this gift, which I feel is really cool. थिस इस अवेसोमे… रेअल्ल्य गूढ़. just in case, you don’t know hindi, the title of this post is “This is awesome… really good”. It is not a translation… just the same words represented in hindi language. I am guessing that this might be the Independence day present that Google was talking about. I am not sure though. Looking forward to the tamil version of the same. Came across this in the official Google Blog. Happy 60th birthday, India! We can’t wait to celebrate, but we’re going to wait a few days for the formal unwrapping of our gift to Indian users. Check back and we’ll have news shortly. Not sure what is it that they are talking about. “… gift to Indian users.”. Like they said, we have to wait and see. 15th August 2007 marks the 60th year of Independence for India. Wishing India a great time in the years to come. Chennai just had Radio Mirchi and Suryan FM (apart from the one from All India Radio – AIR) a while back. Recently, two other stations have launched. And I am guessing that there are more in the pipeline. Is it too many? Is it too little? How many is just right for a city like Chennai? Maybe other cities like B’lore or Mumbai already have more… I am not sure. But can it go on like this for long? I don’t know. Radio stations are different here in India as compared to US. In US, each city has lot of stations, but they all have a set of listeners. Because each station airs a different genre of music ranging from Rock, Pop, Jazz, and so on… But that’s not the way it is in India. Any station in Chennai for example, is pretty much forced to play Tamil movie songs (ofcourse the one from AIR plays some English songs too). So every station ends up playing the same set of songs over and over again. Radio is different from TV. Even if there are ‘n’ TV channels, each channel caters to different kind of audience (News, sports, movies etc). But in Radio, it is songs, songs and more songs. "Throw trash into the trashcans". That's the motto the Chennai Corporation have been trying to get into people's minds to make the Chennai a cleaner place. It sounds so simple. But the problem is there are no trashcans in public areas for people to effectively use them. I was at Marina Beach a week back. I was walking along the pathway (just beside the main road) from almost the Lighthouse to Gandhi Statue (should be about 200-300 meters). I walked the entire stretch looking for a trashcan to dispose some trash. But I couldn't find one. This area is frequented by thousands of people each day for their morning and evening walking schedules and I was surprised to find that there were no trashcans in the entire stretch. I wish the administration took notice of this and take some steps to make Chennai a better place. 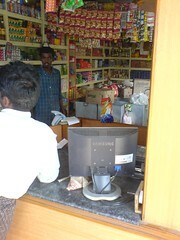 I went to a grocery shop here in Chennai for getting some stuff and I was pleasantly surprised to find a couple of computers in the store. The shop is not a chain store or anything. 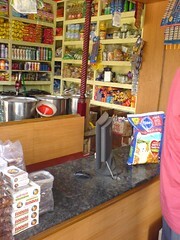 It is just a normal “General merchant stores” that deals with groceries and other stuff for home needs. That’s the level to which the technology has penetrated in India. What’s surprising even more is that both the comps that I saw had flat plans on them. Even most households with computers haven’t migrated to flat panels. This is really a good sign to see that technology is penetrating to the lower levels that signifies growth and that people are getting more and more knowledgeable. PS: Both photos were taken from my mobile phone (SonyEricsson K750i) camera. I got it a few weeks back and this has been first real use of the camera. Hope to use it more often for my blog here.